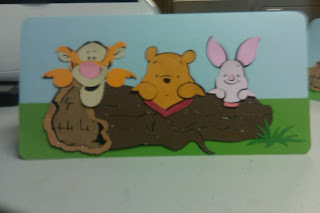 Here is the Project on the Pooh & Friends cart. These are too cute and the log, while difficult to figure out at first turned out quite nice! This is one of my favorite cuts from the cart! How totally cute. Awe this cut is super cute! Looks like lots of layers though! Turned out great! ohhhh wouldnt this be cute in a frame in a baby's room!!! I've gotta a couple of new littles ones coming...ideas ideas! !